“My dear sir,” replied Dr. Montessori, “they will learn to support it by walking through the streets of Paris twice a day, on their way to school and on their way back from school.” Children are better able to take care of their faculties than we imagine, and we need not fear to be over-refining them by making them alive and sensitive to all that they hear and see. The child who is awake to movement and color and texture and sky and wind and stars will not be starved of nature even in a city slum. There are so many myths about Montessori. On a trip to Vietnam I once encountered a public school principal concerned that Montessori wouldn’t work there because, she said, “Montessori is all about the individual, and here we believe in cooperation.” I have heard the opposite, too, of course. A father from Texas told me with perfect seriousness that the big flaw with Montessori was that “the kids don’t have to learn anything, they can just ask another kid for the answer.” Besides, he told me frankly, he didn’t want his son at a school where “they just sit and talk all day.” In contrast, a few months ago I met a mother who happened to visit a normalized classroom at a period of intense concentration. She decided that she didn’t want her child in such an “eerily quiet” environment. Every child is a natural Renaissance master, exploring all of creation without the boundaries of disciplines. They leap from interest to interest with a passionate inquisitiveness. As Montessorians, we nurture their inquiries into the beauty of our world’s mysteries. This makes them more, rather than less prepared to navigate the messy complexities of the real world. We are often reminded that Dr. Montessori developed her method by observing children’s natural behavior; it should be no surprise that it helps the child harmonize so well with the real world. At CGMS we work with schools from many nations, each with its own culture and conditions. Dr. Montessori’s science of childhood revealed a universal approach that works equally well for children in the slums of Rome, an African village, a New Jersey suburb, or the capital of France. There are wonderful Montessori schools on every settled continent, and like the countries they inhabit, each classroom has its own culture. If there is anything that ties these superior schools together it is this – they respect and understand the needs of their children. 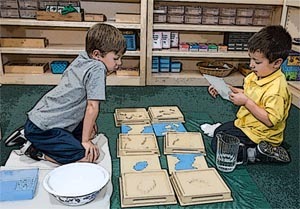 In a Montessori classroom, children will learn to cooperate. They will also learn to work alone. They will socialize. They will focus on their individual work in utter silence. They will do these things because they are human beings, and because the prepared environment gives them the opportunity to act as such. Contrast this with a teacher-centered pedagogy. When children collaborate in Elementary, Middle or High School it is called “cheating”. But in the modern workplace a key predictor of achievement is being able to work well in teams. This is recognized by academics, for example, two researchers from the University of Minnesota said that “learning to work together in a group may be one of the most important interpersonal skills a person can develop” . The importance of collaboration is also recognized by the public at large, as in a 2003 study by the University of Connecticut which concluded that most workers agreed that “being a ‘team player’ is of paramount importance in the workplace”. Montessori schools allow children to develop these essential collaborative skills from the earliest ages. By denying the essential nature of children, traditional schools do a poorer job preparing children for success in the real world. Perhaps at times the world is noisier and less ordered than a Montessori classroom. What of it? Mainstream theories of pedagogy assume that the teacher’s job is to shape the student. But children are not delicate constructions assembled by teachers. Children are consummate engineers. Remarkably, even in impoverished environments, in time most children manage to assemble themselves into functional adults. With the enriched environment provided by Montessori, what might they become? It should be no wonder that a strong foundation may help children develop into remarkable adults. So, do Montessori schools teach enough? Do they teach too little? Do they, as feared by the French gentleman at the beginning of this missive, ill prepare children for the messiness of the real world? These questions all misconstrue what the Montessori method does. It does not “teach”, in so far as teaching is thought of as filling empty heads with knowledge. Instead, it allows children to acquire knowledge in a natural way, while nurturing those critical skills necessary for both individual concentration and team collaboration. If you are interested in the importance of team work in the modern workplace and in research done on educational techniques for developing these skills, we highly recommend exploring www.co-operation.org, the website of Dr. David W. Johnson and his brother Dr. Roger T. Johnson. They offer newsletters, classes, books and plenty of free reading on this essential and fascinating topic.